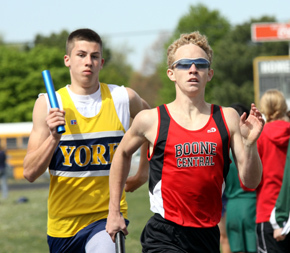 Boone Central always faces some challenging track and field competition when the Cardinals annually meet up with old Central Conference rivals in the Central City and Grand Island Northwest Invites. This year proved no exception as both Card teams finished behind traditionally powerful Class B foes Northwest, York and Aurora in Friday’s Central City Invitational at Bison Stadium. 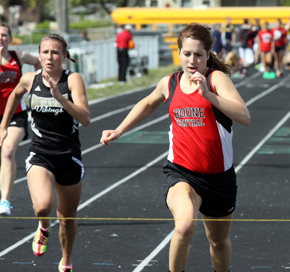 The Boone Central girls scored 92 points in the meet, placing fourth just behind Aurora. Northwest (145) outpointed runner-up York (122) to win the team title. In the boys division, York took the team championship, with Aurora (108) the only other squad to break into triple digits. Boone Central (68) was fourth behind Northwest. “We are really pleased with the competitiveness of our kids,” praised Cardinal Coach Kris Pestel. “This meet had some great athletes and teams participating and we were able to hold our own. The Cardinals did bring home individual gold medals from the Central City competition. Senior Jaime Kennedy had another banner day, sweeping the 100 meter dash (12.8) and 200 meter dash (26.6) and teaming with Olivia Slizoski, Dana Pelster and Breann Thorberg to win the 4×100 meter relay (51.3). She added a runner-up finish in the 400 meter dash in 1:01.4. Kennedy lowered her Albion News area-leading times in the 200 and 400 with the victories and the relay time was also Boone Central’s best in 2012, leading the area. The BC boys received a stellar effort from the 4×800 meter relay team of Brody Kelley, Calvin Koziol, Matt Brugger and Tony Krohn. The Cardinals won the event in an area-leading 8:36.2.